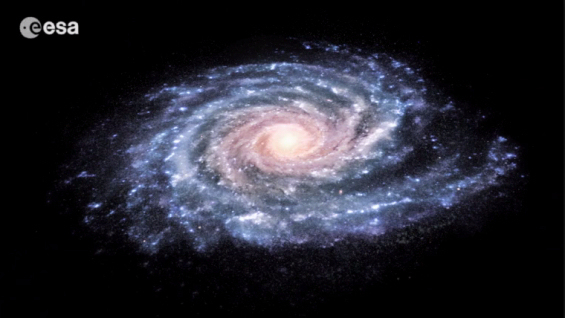 The primary objective of the Gaia mission is to survey more than one billion stars in our Galaxy and beyond. Data from this astronomical census will allow astronomers to answer some fundamental questions about the formation and evolution of our Galaxy, and will provide insight into many other topical areas of astronomy. Some of these are briefly mentioned below. Gaia is designed with a single, primary goal in mind: to investigate the origin and subsequent evolution of our Galaxy, the Milky Way. To do this, it will conduct an astronomical census of 1 billion stars, allowing astronomers to build the most accurate three-dimensional map to date of the celestial objects in our Galaxy. Gaia's mission is scheduled to last for five years. During that time, it will log the position, brightness and colour of every visible celestial object that falls within its field of view. By repeating these observations throughout its mission, astronomers will be able to calculate the distance, speed and direction of motion of each of the celestial objects, chart variations in their brightness, and determine whether they have nearby companions. This kind of data is the lifeblood of astronomy, and Gaia will gather it with unprecedented accuracy. It will allow astronomers to painstakingly piece together the history of our Galaxy, since each celestial object preserves something of the era during which it was born. Our Galaxy is the product of the stars it contains. Just like a city, the Milky Way is split into different locales and surrounded by suburbs. Each of these different areas has their own characteristics that show up in the stars' orbits and chemical composition. Gaia's observations will enable astronomers to identify these regions one from another. As stars condense out of celestial clouds of gas, they naturally incorporate the chemicals found in space. The stars then process this material in their hearts and expel it at the end of their lives. This enriches the galaxy with new, heavier chemical elements that are incorporated into the next generation of stars. Gaia will be able to discriminate between these different generations and so build up a picture of the way the Galaxy was born and subsequently evolved. For stars within a distance of approximately 150 light-years from the Sun, Gaia is expected to find every Jupiter-sized planet with an orbital period of 1.5–9 years. It will do this by watching out for tiny wobbles in the star's position. This behaviour is caused when a star is tugged by the gravitational pull of a planet in orbit around it. In our own Solar System Jupiter, and to a lesser extent all the other planets, do this to the Sun, making it wobble. Estimates suggest that Gaia will detect between 10 000 and 50 000 planets beyond our Solar System. A brown dwarf is a failed star, which fell short of accumulating enough mass to ignite nuclear fusion in its heart. Vast numbers of brown dwarfs are thought to drift, as vagabonds, across interstellar space. Astronomers also expect to find them in orbit around stars, but observations from telescopes on the Earth are not finding this particular type of brown dwarf in their expected quantities. The paucity of brown dwarfs orbiting other stars has been dubbed 'The Brown Dwarf desert'. Gaia will detect tens of thousands of brown dwarfs, both drifting through space and in orbit around other stars, if they are there. The data are vital for astronomers to investigate how stars form, as the brown dwarfs represent the ones that did not make it. The more gas there is locked inside brown dwarfs, the less there is to make real stars. Closer to home, there is currently great scientific and public interest in detecting our Solar System's inventory of asteroids and comets. Gaia is contributing to this search because of its unprecedented sensitivity to faint, moving objects. It is expected that over the course of the mission the spacecraft will detect hundreds of thousands of minor planets, some known and some new discoveries. Some of them will be near-Earth objects (NEOs), others will live in the 'main-belt' of asteroids between Mars and Jupiter, yet more will be located in the icy realms of the outer Solar System known as the Kuiper Belt. During Gaia's five-year lifetime, calculations suggest that the spacecraft will detect some 100 000 exploding stars (supernovae) in distant galaxies, before they reach their maximum brightness. This will provide an early warning system for astronomers on Earth who wish to study them and use them to gauge distances to the host galaxies. It is essential to observe such supernovae as they are still climbing in brightness. This is because the peak brightness they reach is the essential measurement for calculating their distance. Far out in space, Gaia is in a prime location to make such observations. Gaia's scientific harvest will allow Einstein's theory of General Relativity to be tested as never before. This is because the accuracy to which the spacecraft can measure positions is so great that usually negligible gravitational effects will show up in the data. One such distortion is the bending of light by massive objects. As light passes by the Sun, or a planet in our Solar System, it is deflected slightly by that object's gravitational field. This means that the star's position will appear to move slightly. Gaia will detect this shift and allow the most precise measurement of this effect ever. Another consequence of General Relativity is its prediction that the fabric of space, the so-called space-time continuum, can 'ripple'. These movements, called gravitational waves, cause distortions that will alter the apparent position of a star. As yet, gravitational waves remain undiscovered but Gaia's precision observations will allow astronomers to calculate upper limits on their strength. This will help to pin down the accuracy that gravitational wave 'telescopes' will need to achieve if they are to detect these elusive ripples. Another tantalising possibility is that the strength of gravity is changing slightly every year. Whilst this can only be a minuscule variation even during a human lifetime, it could mount up into something significant over billions of years. Gaia will pinpoint white dwarfs, the cooling remains of dead stars. These give out heat for billions of years according to their pull of gravity. The amount of heat they give out determines how brightly they shine. If the strength of their gravity has decreased, then the white dwarfs will be dimmer than expected. So Gaia's census of white dwarfs will afford astronomers an insight into the amount of any decrease in gravity that has taken place.